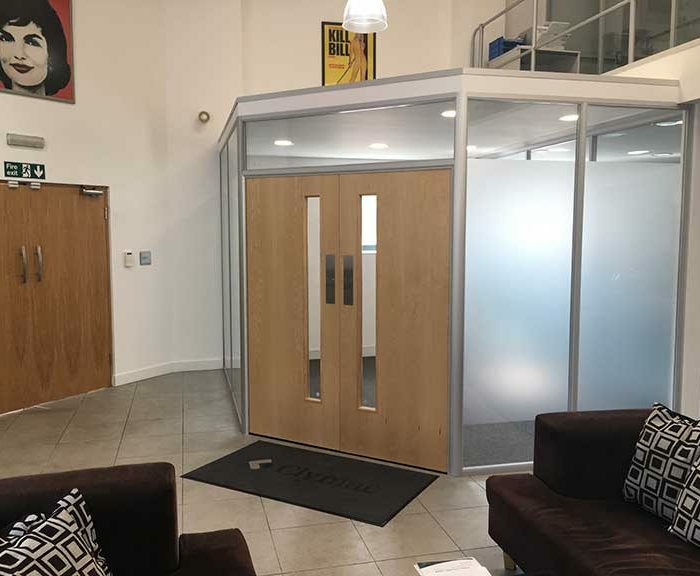 Elite Partitions and Interiors are Nottingham’s leading glass office partition supplier and installation contractor, with an unrivalled portfolio of completed projects for a range of local clients. Our deep industry links mean we are able to source and install all varieties of glass office partitions, doors and windows, from modular glazed to frameless glass partitions, screens and doors, including those with glass manifestations, frosting and custom graphics. No matter how detailed your requirements might be, we can provide materials which contain each one. 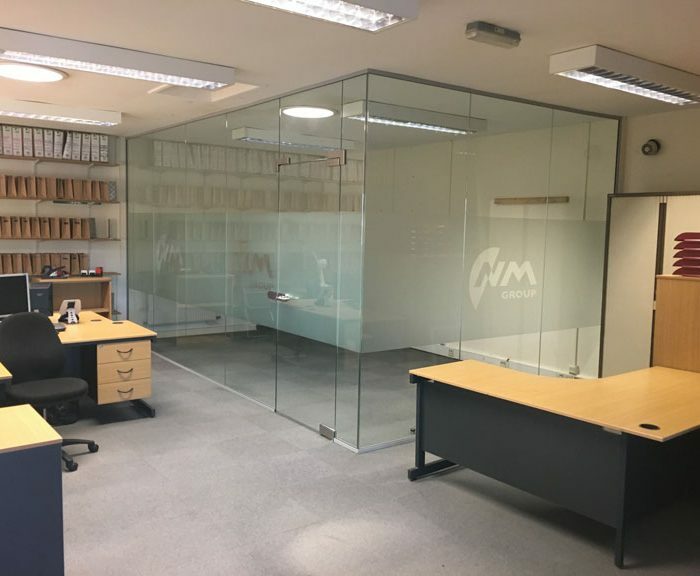 We are also able to match the appearance of your existing glass partitions, should you wish to update your office without making unnecessary changes to its overall design. We are equally happy to discuss alternative partition style choices you might be considering, in order to provide a range of alternative recommendations to suit your preferences and budget. Regardless of your plans, our team of glazing specialists will accommodate every aspect of them, and will ensure your job is completed with the minimum of disruption. We serve all areas of the East Midlands and West Midlands including Nottingham, Derby, Leicester, Coventry and Birmingham. Frameless glass partitions are by far the most popular and appealing choice for clients in an array of industries, all of whom are attracted to the stylish design and sleek facade these premium options enjoy, and how these features evoke an air of exclusivity wherever they are found. The frameless finish adds up to a seamless construction when installed in any configuration, which adds to the tactile qualities of this very attractive option. They are an unrivalled solution for dividing meeting rooms and other private spaces, with privacy increased should any frosting option be added to them. They have a very specific ability to transform and modernise office interiors, given their elegance and luxuriousness, and suggest a professionalism when combined with various custom glass manifestations and graphics. Frameless glass partitions are also available in a double glazed form, which provides very efficient sound insulation. Features such as these are a practical example of what makes them an ideal choice for ensuring privacy is maintained. As a further such measure, integrated blinds housed in glass screens and doors can also be fitted, which ensures they are held securely and look presentable even when not in use. The prestige of these partitions doesn’t mean they need be out of reach, as we can tailor a package including them to suit any budget, and we invite you to contact us to discuss your requirements. Our basic framed glass office partitions are the most cost effective means of partitioning your office, but while still allowing natural light to spread throughout the space. Given their small footprint, this popular option also preserves the spaciousness of the area they are installed in, as they make for a very unobtrusive construction. Their slim appearance doesn’t mean that their structural integrity is compromised though, as they are a very sturdy and reliable partition. In common with the more expensive frameless option, the framed partitions have glass frosting options available in order to maintain privacy, while custom glass manifestations can also be added, should an additional stylish and professional finish be sought. Of most appeal so far as this partition is concerned is it being within the reach of most budgets, and the range of customisable options which make it a suitable choice for most tastes and offices. Contrary to popular belief, glass partitions needn’t cost a fortune. Our appealing range of budget partitions also includes glass partitions, which are the most affordable option for businesses of all sizes. No matter whether you’re interested in framed or frameless glazed partitions reinvigorating your current office design and layout, we are extensively experienced in the design, supply and installation of all types of glass option partitions. These can include partially or fully frosted glass screens, walls and doors, with either glass manifestations and customised graphics etched into the glass itself, or a band of frosting. Choosing a fully frosted glazing option is usually the right decision when privacy is a paramount concern. When combined with our glass etching service, fully frosted glass will further suit your privacy requirements, while simultaneously adding a professional and stylish look to your office. Partially frosted glass provides a reduced degree of privacy, but increases the elegance of your glass partition configuration or meeting room. First and foremost a safety feature, these are often a compulsory requirement in order to prevent people accidently walking into glass they would otherwise not be able to see were it not for the application of the manifestation, as it makes sheer glass surfaces visible and prevents accidents. All our manifestation designs adhere to building regulations and come in an attractive range of styles, so there’s no need to forsake design decisions when applying glass manifestations. As an alternative to glass manifestations, we are also able to design then produce any graphics you require applying or etching onto either your glazed screens or doors. These can include logos, pictures and shapes, all produced in any colour to suit your branding or design scheme. A popular and professional choice is to have your company logo etched into a panel of frosting placed horizontally across glass walls and doors, as this produces a very stylish effect. Please feel free to get in touch today to discuss your requirements, and to obtain a free and no obligation quotation.